SUBHEAD: United States faces major trade negotiation setback as Europeans revolt against TTIP. Image above: Europeans demonstrate against American corporatism of TTIP. From original article. France wants to halt thorny EU-US trade talks on the Transatlantic Trade and Investment Partnership (TTIP) as President Francois Hollande underlined there would be no deal until after President Barack Obama leaves office in January. Matthias Fekl, the French minister for foreign trade, has said his country will call for an end to the deal. France has been sceptical about the TTIP from the start and has threatened to block the deal, arguing the US has offered little in return for concessions made by Europe. All 28 EU member states and the European parliament will have to ratify the TTIP before it comes into force. The statements came just a couple of days after German economy minister Sigmar Gabriel had said talks for TTIP had de facto failed. Gabriel, who leads Germany’s centre-left Social Democratic party and is vice-chancellor in the coalition government, said Europe mustn’t submit to the American proposals. Mr. Gabriel’s statement is in contrast with the position of Chancellor Angela Merkel who supports the deal. Meanwhile, the US-German conflicts are growing. US courts and authorities took a hard line against the Volkswagen Group, Germany’s largest car manufacturer, in relation to its exhaust scandal. In a deal that does not include all damage claims, VW is required to pay up to 13.6 billion euros. There is a growing chorus in Germany saying that the country should orientate more to Asia. 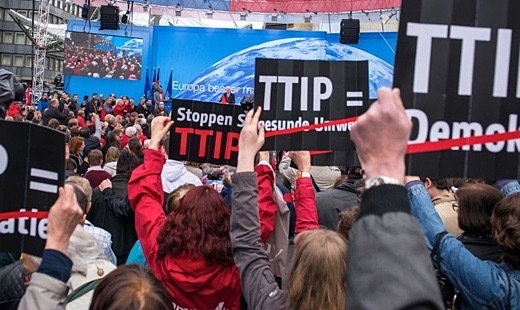 This perspective shared by the organizers of the anti-TTIP lobby, including the German Trade Union Federation (DGB), the Left Party and the Greens. TTIP negotiations have been ongoing since 2013 in an effort to establish a massive free trade zone that would eliminate many tariffs. After 14 rounds of talks that have lasted three years not a single common item out of the 27 chapters being discussed has been agreed on. The United States has refused to agree on an equal playing field between European and American companies in the sphere of public procurement sticking to the principle of «buy American». The opponents of the deal believe that in its current guise the TTIP is too friendly to US businesses. One of the main concerns with TTIP is that it could allow multinational corporations to effectively «sue» governments for taking actions that might damage their businesses. Critics claim American companies might be able to avoid having to meet various EU health, safety and environment regulations by challenging them in a quasi-court set up to resolve disputes between investors and states. In Europe thousands of people supported by society groups, trade unions and activists take to the streets expressing protest against the deal. Three million people have signed a petition calling for it to be scrapped. For instance, various trade unions and other groups have called for protests against the TTIP across Germany to take place on September 17. A trade agreement with Canada has also come under attack. Both deals have been problematic, primarily because they contain clauses that would allow corporations to sue sovereign nations and are seen as a US attempt to assert political, diplomatic and corporate influence. As illustrated above, even Americans reject them, blaming the North American Free Trade Agreement for the exodus of American manufacturing to cheaper destinations. But the failure to push through both agreements will put into doubt the US status of global superpower. Student loans are up. So too are food stamps and health insurance costs. In the meantime, labor force participation, home ownership and median family incomes have plummeted. The US government's $19 trillion debt is a huge problem. Long wars in Afghanistan and Iraq have exacted an enormous price - immense financial expense, estimated to be as high as $6 trillion (£3.9tn). The detention centre at Guantanamo Bay, as well as the NSA and Wikileaks spying scandals, have undermined the belief in American values and American diplomacy. The defense expenditure is huge, but its effectiveness is questioned. «We’re in a dramatic crisis now. There is no question that we’re capable against the threats on the counter-terrorism side, but we’ve reached a point where we’re in fact—not heading towards—but we’re already hollow against a high-end threat, said House Armed Services Committee majority staff director Bob Simmons speaking before an audience at the American Enterprise Institute (AEI) on June 21. We lack the capacity and capability that we need to effectively deter on the high-end. Among the foreign policy disasters in the Middle East, the rise of the Muslim extremists in several nations has created a crisis for all of the West, including the United States but most immediately and especially for refugee-swamped Europe. The West is reaping the results of America’s foreign policy failures as it struggles to cope with hundreds of thousands of refugees pouring out of Syria and the Middle East. >There is scant evidence that this century the US has achieved any progress pursuing its foreign policy goals. And while the US has stagnated, some countries, like Russia, China and many others, have prospered. This combination of decline at home and rise abroad has reduced America’s international power markedly.